The ELT is a project of the European Southern Observatory (ESO) to build and operate a 40 m class optical, near- and mid-infrared, ground-based telescope that will be installed on Cerro Armazones in Northern Chile. When it will enter into operation, the ELT will be the largest optical telescope ever built. It will not only offer unrivalled light collecting power, but also exceedingly sharp images, thanks to its ability to compensate for the adverse effect of atmospheric turbulence on image sharpness. The optical design of the ELT is a folded three-mirror anastigmat, using a 39 m segmented primary mirror (M1), a 4 m convex secondary mirror (M2) and a 4 m concave tertiary mirror (M3). Folding is provided by two additional flat mirrors sending the beams to either Nasmyth foci along the elevation axis of the telescope. The folding arrangement (flat M4 and M5 mirrors) is conceived to provide conveniently located flat surfaces for an adaptive shell (M4) and field stabilization (M5). Major characteristics and challenges of the different optomechanical systems are explained. An overview is given of the cascade of various control loops running to keep the optical system of the ELT aligned while compensating image quality degradation due to adverse environmental conditions like gravity deflection, wind load, thermal deformation and atmospheric turbulence. To guarantee the required performance, the design is heavily relying on simulation and analysis, for which the simulation strategy of ESO is shown for the primary mirror control. 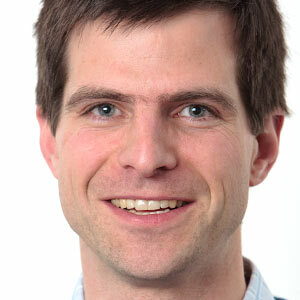 Michael Müller studied aerospace engineering at the Technical University München, where he also received a PhD in engineering. Since 2004 he is working at ESO initially in the system analysis department and later in the mechanical department, where he is responsible for the structural analysis group. During the conceptual design phase of the ELT, Müller was involved in the design of the telescope structure and the 5 mirror units of the telescope. Especially he took care of the modelling of the structure-control interaction as well as the structure-optics interaction. In addition to these kind of system simulations, he is currently managing the design contract for the mechanical units of the secondary and tertiary mirrors.